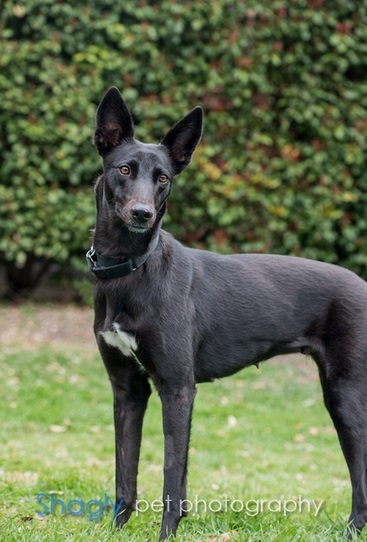 Hera is a black female greyhound mix estimated to be about 1½-years-old. She was surrendered to the Humane Society of North Texas six weeks after whelping puppies. Her puppies were not surrendered with her. Hera will be spayed once her milk dries up. Hera's DNA results indicate that she's a Greyhound / German Shepherd mix. Hera has passed an initial cat test and has lived with a cat and a small dog in a foster home. 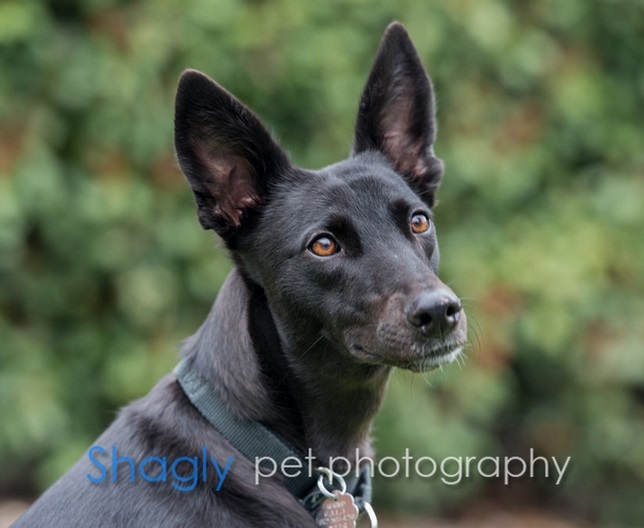 Hera is a cuddly, healthy, sweet-tempered Velcro dog who is eager to please and a bit of a flirt. She badly wants to be a lap dog and she should probably be in a home where furniture is not off-limits. She's been one of my easiest fosters, coming to the house with good manners and smarts. Within a half-hour, she used the doggie door and has never had an accident in the house. Still a puppy at heart, she likes to collect shoes, slippers and clothing. She doesn't chew them though; she just likes them handy. A slow eater (of edible objects), she needs to be separated from her four-legged companions to make sure her food remains hers and not their. Although she is well-behaved with cats and other dogs of all sizes, she'd also make a good only dog. She likes her alone time and seeks it out for herself during the day. She is a snuggle girl, though also crates easily and likes her x-pen, retreating to either during the day when she needs a break. She sleeps all night in the crate and is either there or in the x-pen when I leave the house. She has no crate or separation anxiety. Is this petite little pumpkin the lap-sitting pooch for you?